Kalia is asking them what are they thinking is going on. JJ have no clue they think they’re safe but the have no idea. Kalia says she would be super duper shocked it JJ went up. Jeff says they would to. Kalia adds that she thinks that Adam has some special power something is up with him. Jeff: “No frickin way” Jordan also doesn’t think Adam has any power. 8:25pm Dani and Rachel Living Room playing their jelly bean game Dani wants to know what everyone was talking about in the HOH today. Rachel says that Shelly and Jordan wanted to see how she was feeling after the POV comp and wanted to know it Rachel it using it. Dani has noticed that Jordan has been really nervous after they won the POV I think she knows she did messed up when she didn’t pick you for the luxury comp. Dani points out that Jordan drew the lines when she did that. Dani tells him that her dad did a deal with Prosche that if she throws ever single comp then he’ll keep her around till the end.. Dani laughs says if POr does a deal like that anything is possible. Dani tells her that Rachel and Brendon winning things they are making themselves HUGE target. Dani: “Don’t think for a second that Shelly is not going to win comps” Dani goes on to explain that Kalia and lawon are useless they will never win anything. Rachel asks what is up with Kalia. Dani says Kalia would do anything to be with us and she really wants Lawon gone. Rachel says she feels like everyone will put her up if they don’t win HOH. Dani says Jordan .. shelly (Too quiet I can’t hear what she said). Rachel wonders if everyone is going to try and win the HOH next week. Dani thinks the entire house will battle except for Kalia. Dani is positive it will be endurance it’s week 4 and every year it’s endurance week 4. Dani says she really wants to win HOH she hasn’t had a chance to play before she wants letters she wants to feel safe for a week. Dani just for a moment imagine the 4 of us winning HOH/POV back and forth back and forth.. (Rachel just keeps her head down playing the game) Shelly joins them. Kalia says she’s never really talked game with Shelly and after what rachel said during the nomination ceremony about “If you’re not talking game to me your talking aginst me” it’s made Kalia want to talk to Shelly about the game. Kalia feels that she’s safe in the house there no one really gunning for her. Kalia wants to know where Shelly is at. Shelly explains that she want to get to single and wanted to do it with her partner but it didn’t work out. Shelly says she’s playing a really straight up game and she thinks so is Kalia. Shelly claims to know who is lying in the house and who are the strong players and she’s only going after people that are after her. Kalia says that the only person she thinks will put her up will be Adam. Kalia wants Adam gone. 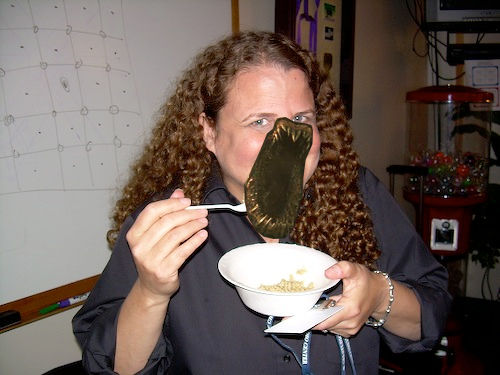 watching BBAD and AudreyII is totally getting on my nerves. she never shuts up!!! agreed. did anyone catch her on BBAD last night, throwing a fit about her bed? 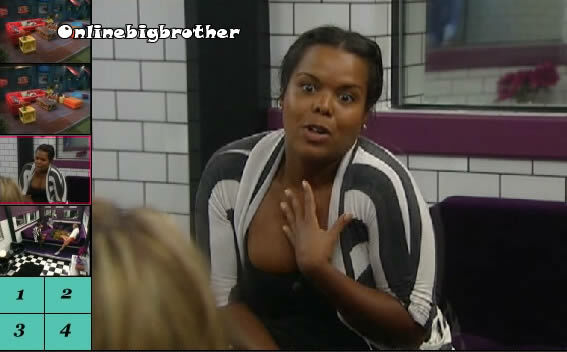 she was legitamitely screaming and you could tell the other houseguests were a little fed up with her behavior. Oh yeah – and all the whining about hair on the bed. Listen, for someone whose fingers are constantly on and in her nose and then picking her teeth, hair on her sheets are the least of her hygiene issues. What a diva! I figured it would only be a short matter of time before Audrey 2 reared her ugly head. Yes Kalia is annoying me to no end. That fit she threw last night was hilarious. Haha! In all fairness she did admit in the first day or two that her family or I think her mother said she talked too much and too fast. Guess she was forewarning everyone. I’ve never seen anyone spew out so much nonsense. When she can’t think of anything to say she makes up odd noises or grunts. I could definitely tell that Shelly was annoyed inspite of the joke. Kalia acts like she has some type of hyperactivity disorder or she’s just really immature. She just talks talks and talks to the point you can’t really trust her or even get a chance to try to like her. I really can’t tell where her loyalties lie from watching BBAD or the updates. It’s not clear is she’s with Jordan or just riding through. For the people actually watching the live feeds, what is the status of Dani within her “alliances”? I was wondering if BR were actually still planning to work with her because she does give some good points about any America’s vote going to Jeff, and BRDD becoming the strongest side. If it’s XXL it would fit Allison Grodner . Dani must go stupid they let her get away with mouthing words why the heck mic them then? Getting sick of her whispering. She did it a lot in her season too. They should give her a penalty of some sort and I bet she would stop. Hate to say it but if Rachel is too quiet, Dani will become suspicious. She’s a smart cookie. Devious like dear old Dad. Rachel should contiue to rant about backdooring JJ when she’s with Dani. Por really should not be wearing the shirt she is wearing on BBAD. I would feel comfortable wearing a shirt like that around her and I have had a 10 and 11 pound kid and I am near 40 lol she has quite the gut on her now. Ok dani and kalia whispering is getting annoying. What happened to Brendon’s knees? Did he beat them up in the Picnic game? Can someone please tell me who Audrey II is and why she is called that? I guessed it was Kalia but I don’t get the audrey II reference? umm are jordan and jeff trusting kalia? she’s telling dani that jeff warned her (kalia) not to say to much to dani…please tell me that jeff is doing that on purpose?!? Kalia lacking game play is a nice way of putting it. Can she be anymore obvious suddenly claiming to Rachel she doesn’t trust Lawon. What a coincidence that she’s been scheming/talking with Dani and now magically she has this revalation Lawon is bad news. I’m sure the idea is to suggest using the POV and getting out Lawon instead. Puh-lease! IMO, Dani is making a huge mistake. She needs to let Dom go and rebuild trust/re-align with vets. It’s too early in the game to be more loyal to Dom at this point. Do the math: Alliance of 4 is better than an alliance with 1 who is probably on his way out the door. Dani needs to wake up and fix her mess because we need her around to get B&R out later! She’s the one with the best chance dominating them in comps. just want to say your doing agreat job on this site first time writing just want to thank you for all your hard work…. Yeah right! These two were the first ones run to the vets and vote against their newbie alliance the first week. They’re both snakes but they act like they arent which makes them even BIGGER snakes. Kalia is just a waste of a spot in the game. I totally didn’t get the whole rant Kalia launched into against Lawon last night. She talks so much she even forgets her own lies. 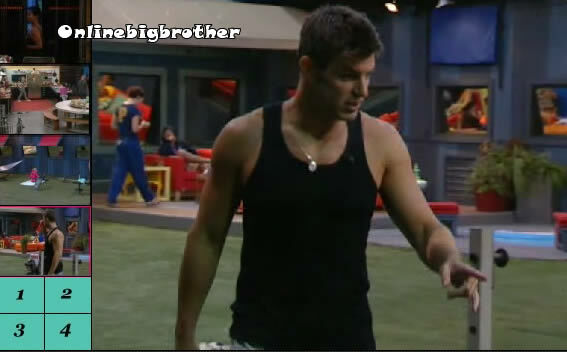 She accused him (Lawon) of spreading a rumor that she didn’t want to be in the house early on. Uh what I recall was her ditzy scheme to get herself nominated so she could get a golden key. She was the one who started that rumor. And then there’s Lawon, utterly clueless. He was raving about how tight his alliance is with Dani who had just recently heard Kalia complaining to Dani about how she wants him gone.